I think open-water swimmers have a dark core. Maybe it’s the unknown depths, the inky blackness of it. Maybe it’s the sense of aloneness in the water, that despite the safety boats, kayaks and lifeguards, you could still slip quietly into the dark depths. That’s what happened to team USA Olympic marathon swimmer Alex Meyer’s training partner and like-a-brother friend, Fran Crippen. After a 2010 race in the United Arab Emirates, Meyer noticed that the 26-year-old Crippen was not at the finish line. Two hours later, divers found his body. The water temperature that day for the UAE event was 90 degrees, likely contributing to Crippen’s probable extreme dehydration and possible heat stroke (the coroner’s report was inconclusive as to the exact cause of death). Since then, a debate continues as to maximum safe water temperature for long-distance swim events. The sport’s main governing body, FINA, has come under fire for its vague guidelines. During yesterday’s London 2012 10K open-water swim marathon, Meyer said his thoughts kept coming back to Crippen. “I was battling some pretty negative thoughts in the last lap, trying to keep those subdued.” said Meyer in an ESPN interview after his disappointing 10th place finish. In triathlons, including amateur events like the ones I do, the swim portion always causes the greatest anxiety. Water temperature isn’t usually the concern, but inexperience, fear of the unknown and the rough-and-tumble nature of triathlon starts all combine in an anxiety-inducing cocktail. In the 2011 Nautica NYC Triathlon, two people died during the swim; once was unconscious when pulled from the water. The other died the next day. I joked this year that I had a 1:1500 chance of dying in the same event (now the Aquaphor NYC Triathlon), but there was no denying that people were spooked. Nervousness about the swim portion was the main topic of conversation among my fellow competitors as we watched the first of the swim heats hit the water. Everyone was relieved this year when no one was hurt during the swim; organizers had instituted a new time-trial start that allowed for better visibility of swimmers, and more safety staff were on hand. In an email conversation with John Korff of Korff Enterprises, which organizes the triathlon, Korff said he thought about the swim “a few thousand times” that weekend and was relieved it went well. I feel for Meyer. He’s fighting for safety improvements in a sport that took his friend. Although supporters are calling for clear rules regarding minimum and maximum water temperatures, FINA still won’t make the call. ** And despite the organization’s own “recommended” max temperature of 87.8 degrees F, it held its last world championship race in Shanghai, where water temps were in the 90’s. Meyer and two other athletes withdrew in protest. Meyer is battling demons on several fronts, clearly. I wish he’d made it to the podium yesterday, but I’m inspired even more by his tenacity in a sport that’s taken so much from him. Congratulations, Alex. **At least U.S. 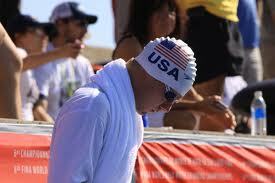 Swimming has responded, instituting an 85.1-degree temperature limit as a rule for events held in the United States. This entry was posted in People and tagged Alex Meyer, Fran Crippen, swimming, triathlons. Bookmark the permalink.